[June 26, 2014] At midnight tonight, Canadians can breathe a little easier and speak their minds online, thanks to Bill C-304, which officially comes into ‘force’ on June 27, 2014 and repeals Section 13 of the Canadian “Human Rights” Act. 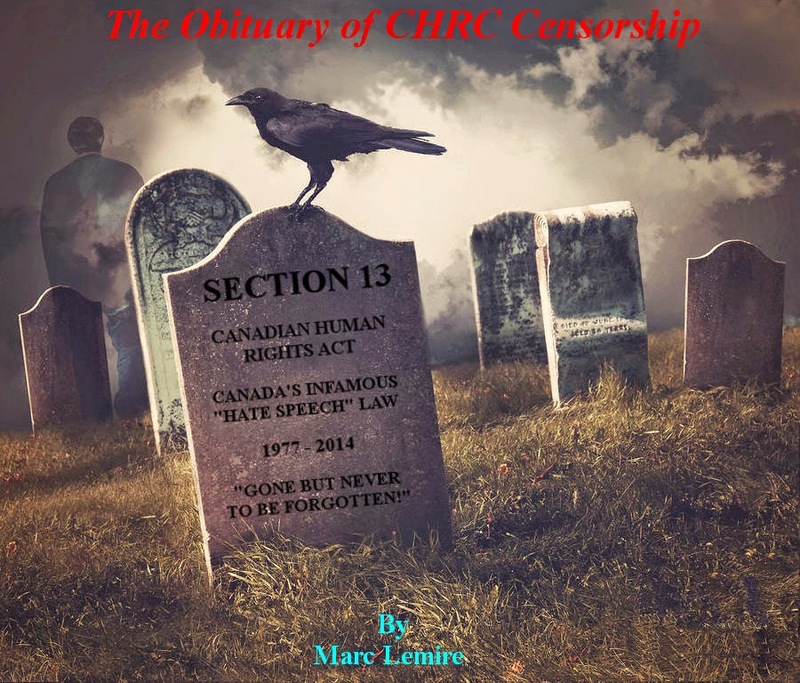 Bill C-304 stripped the censorship powers from the ravenous censors at the Canadian “Human Rights” Commission who dragged hundreds of Canadian’s through a rigged Tribunal process – success guaranteed; a complete 100% conviction rate! Section 13 of the Canadian “Human Rights” Act was passed into law in 1977, and in the intervening 37 years, it was used and abused by a fanatical band of censors at the Canadian Human Rights Commission to harass and silence Canadians of all political strips. Originally Section 13 only applied to telephone answering machines, where people could leave an outgoing “hate” message. That is a pretty odd thing to have covered by a law, but it was carefully crafted in order to silence one man - John Ross Taylor – who was a rather eccentric elderly gentleman that recorded his viewpoints on a telephone answering machine which people could call into and listen. As is typical with over-paid fanatical bureaucrats, it wasn’t enough to just harass a couple of Canadians who dared to record their thoughts on a telephone answering machine. Mission creep set in; and the CHRC took it upon themselves to reinterpret Section 13 and claim that the entire Internet was in their jurisdiction because it was part of “a means of the facilities of a telecommunication undertaking within the legislative authority of Parliament”. In other words, because in the 1990’s you needed a telephone and a modem to access the Internet, the CHRC claimed they had jurisdiction and accepted a complaint against Holocaust Revisionist and (then) German-Canadian publisher, Ernst Zundel for posting on the Internet, which were allegedly associated with him. That was the very first Internet “hate” case in the 1990. The CHRC was beyond pleased that it could scour and others could “tame” the internet. While the jury was still out if the original intent of Section 13 could be applied to the Internet, the Federal Government slipped one line into Canada’s Anti-Terrorism Legislation (2001 – Bill C-36) which gave the CHRC carte blanche to police and censor the Internet. Once it was clear that the CHRC could police the internet, the CHRC went on a Blitzkrieg to shut down websites. Without a ruling, or court order, the CHRC starting writing to Internet Service Providers of people they wanted to Silence. Amongst those people were Ernst Zundel, UUNET, Ottawa FreeNet, various people on AOL who were critical of homosexuality, and various other websites. The real problem the CHRC had was that no one was complaining to them. They had invested all this money; they had a special “anti-hate” team, special “anti-hate” committee, special lawyers, a special Compliance Manual for “hate cases”, policy advisors, etc; but no one was complaining to them. (Gee, sounds like Canadians could handle free speech on the internet just fine without them). The CHRC even went around to various organizations begging them to lay complaints (2006: CHRC head ‘hate’ policy advisor visits “A couple representatives of the Muslim community” to stir up some complaints). The problem with complaints disappeared when a former employee of the CHRC filed upwards of 26 complaints with the CHRC over internet based content. In the 37 years that Section 13 was a law in Canada, not a single person ever ultimately won a case. Yes, you read that correctly; the CHRC has a 100% conviction rate. I was the only person to come close – in that the Canadian Human Rights Tribunal threw out the case against me, but the wacky Federal Court of Canada reversed it and found me guilty of a single posting on my website, what I neither wrote nor approved of. Not only is there a 100% rate, there is also a 100% lifetime speech ban rate. Every single person who has been taken to the Human Rights Tribunal is now under lifetime speech ban. This lifetime speech ban (called a Cease and Desist order) forces the person to never post material again on the Internet which is “likely to expose a person or persons to hatred or contempt..”. If violated it would mean a “contempt of court” charge and up to five years in jail. So far multiple people have been imprisoned for violating the lifetime speech ban. The jail sentences have been up to (and more) than a year for some people. When Section 13 was just used to attack marginalized and poor Canadians (most people charged under Section 13 could not even afford a lawyer), it was not a major public issue. But the CHRC just could not leave well enough alone. The CHRC – drunk with power and a 100% conviction rate – looked to new horizons to expand their censorship powers. This ultimately proved to be their biggest tactical mistake. The CHRC accepted a ‘hate’ complaint against Macleans Magazine and Mark Steyn. This coincided with a ‘hate speech’ complaint against Ezra Levant for publishing the Danish cartoons of Mohammed. Well… the preverbal “sh*t hit the fan” and suddenly the backroom censorship of marginal people by the CHRC; their tactics and the corrupt system they operated in; was front page news. Newspapers and magazines across Canada denounced the CHRC and Section 13. Mark Steyn was not about to shut up either. For years, Steyn or the mainstream media didn’t really know or pay much attention to the machinations of the CHRC censors, well… that was all about to change. Stay tuned for Part 2 of my Section 13 obituary.